Drift Innovation X170 Extreme-Extreme-Extreme Action-Action-Action Camera | OhGizmo! If you go for the gusto every moment of your life, but are looking for a rugged camcorder that isn’t quite so ‘extreme’, you might want to check out the X170 from Drift Innovation. 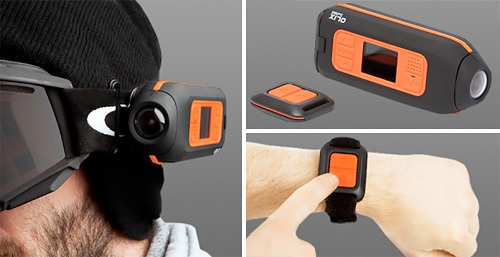 Its compact design makes the camera easy to strap to a pair of ski goggles or the handlebars on your bike, and it appears to be pretty durable, including the waterproof wireless remote that can be strapped to your wrist, but I’m afraid the ‘extreme’ stops there. The X170 can only capture videos at 720×480 (and probably even less than that in 16:9 mode) but you’ll be hard pressed to tell they’re not hi-def while reviewing footage on its miniscule 1.5 inch LCD display. However an included break-out cable does allow you to watch your clips on a full-sized TV. The 170° wide angle lens is great for capturing all the action going on around you, and it can be rotated through 300° depending on the orientation of the camera when its mounted. The 32MB of built-in memory is pretty much useless, but thankfully an SD slot supporting cards up to 16GB in size should provide hours and hours of recording at 720×480, or thousands of 5MP digital photos. All that for $199.95. If you're gonna buy one, first check out https://www.mypov360.com/indy-500-launch-party-…. If you enter your name and email you will be automatically entered for the chance to win a $500 shopping spree toward the purchase of a POV camera such as the X170 or even the HD170 this July.